The following examples show some of our range of controls and some of the customisations that have been implemented. The AC3 control may be configured to provide high power 240VAC relay outputs, analogue and digital inputs, quadrature encoder input, real time clock and user interface via LED or LCD, switches or keypad. The control also supports multidrop serial communications. May be provided with RF link for communicating with other Aims controls, for user interface or remote sensors. AC3 controls tend to be used in the industrial / commercial environment and can be provided with a range of user interfaces appropriate for the application. This customisation of our AC3 control provides two GPO outputs for the control of external loads and has a temperature sensor input. This control provides a thermostat and fault monitoring function. 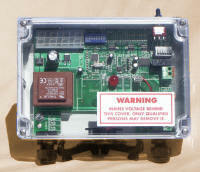 Options include configuration as a differential temperature controller and provision of waterproof enclosure and GPOs. This customisation of our AC3 control uses a waterproof enclosure and provides automatic pump control and flow monitoring. The user may select automatic or manual operation and different failure mode responses. This customisation of our AC3 control uses a waterproof enclosure and provides a local alarm monitoring function and interfaces with other Aims controls to monitor their status and alarms. The control displays local and remote alarm conditions and can interface with higher level monitoring systems ( BMS or SCADA ) via a simple contact closure or serial channel. The alarm also has built in strobe and siren for local audible and visual alarm. The alarm may be cancelled locally or remotely. Thus the control may act as a stand alone alarm, as a supervisor for a group of Aims controls and as an alarm concentrator for interfacing with a higher level supervisor system. Options include system control and automatic notification of status and alarms using SMS, email or other suitable messaging system over fixed line, LAN, mobile phone or other suitable communications channel. Other customisations include cut to length operations such as roll forming or wire cutting, batching, weighing and testing and differential temperature control as in Solar Hot Water Systems. These controls may be configured with relay outputs, analogue and digital inputs and multidrop serial communications. These controls may be either 240VAC or 12 or 24VDC powered, with corresponding outputs. The AC2 control is housed in a non waterproof enclosure that requires further embedding in a final product or sub-system. This customisation of the AC2 control is used for Solar Hot Water Systems and is supplied in a Pump Box Assembly with a pump, non-return valve, couplings, temperature sensors and provision for connection of solenoids. AC2 Controls may also be supplied in waterproof enclosures. Other customisations include use as I/O expansion for other Aims controls. 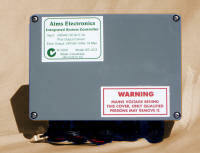 May be provided with RF link for communicating with other Aims controls, user interface or remote sensors. In some circumstances it may be desirable to avoid wiring connections to a control. A remote sensor that uses an RF link to interface with an Aims control may be a solution. 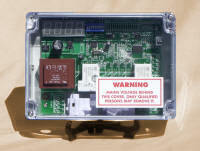 The remote sensor, shown right is configured for temperature measurement and is provided with a solar power supply. The same device may be used to provide an RF link between Aims controls or to any device that has a serial interface, such as a PC or intelligent instrument.